None of this new and fixing it is not rocket science nor is it politics. The Pinellas County School board voted this week to enter into an agreement with Learning Services International to operate three Pinellas County schools the school board has been unable to advance to a “C” grade after years of struggling. The move is a result of new state law House Bill HB7069. The three schools are Lakewood Elementary, Fairmount Park and Azalea Middle. You can get more detail in this article from the Tampa Bay times Colleen Wright; Under Undera new law, some public schools will be managed by companies. Pinellas is getting ready and Tampa Bay Times Staff, Today: Pinellas prepares to turn three public schools over to a private company. And this follow up by Colleen Wright: Pinellas contracts with outside company to turn around struggling schools. Be sure to read the quotes from superintendent Mike Greco and Board Chairwoman Rene Flowers. In August of 2015, I Posted: Failure Factories - Tampa Bay Times and In April of 2016 I Posted: Pinellas County failing schools – what now? Here we are almost three years later, and the Pinellas County School Board has still not been able to figure this thing out. And then there is this from December 1996 By Bruce Goldberg writing for the CATO Institute: Why Schools Fail. None of this is new and fixing it is not rocket science nor is it politics. I came to Pinellas County in 1968 with a 3-year-old daughter to work for one of the area’s large military defense contractors, and we almost did not accept the job because of the County’s educational reputation. My daughter remained in and graduated from the public-school system went on to get a Master’s degree and a PhD, but public school was a struggle from start to finish, and most of our friends opted out for private schools. Things don’t seem to have changed much. What is the common thread? To me, it is the form of educational governance with a political elected school board. It is amazing to watch an interested parent or former teacher run for the school board and gets elected to the school board then to turn into a consummate political idiot. What is the real difference between schools operated by the school board and a private company like with Learning Services International or a charter school? Just one thing governance. The people who run them don’t have to cave into every whim of a well healed parent, and they are not running every decision through the lens of how many votes will this cost or get me. 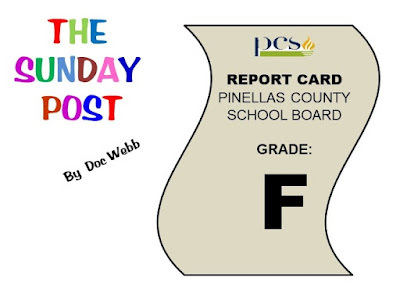 To me, the real failures and those who deserve an “F” grade is the majority of those who have served on the Pinellas County School Board since I got here in 1968 and right up to this vote to turn these schools over to Learning Services International. You only need to watch one school board meeting in Pinellas or Hillsborough county to quickly figure out this is I all about votes, politics and getting re-elected. One of the really significant changes to school board governance would be a two-term limit imposed by the state of Florida. There should also be a provision that prevents anyone from the school system running for the governing school board for five years after they have left the employment of the board. School boards like to blame the kids, parents, social media, cultural changes and a host of other things. If they are really looking to place the blame, take a stroll down the hallway to the bathroom and look in the mirror.